It is important for every professional, to find the most comfortable and supportive pair of shoes for office or work, especially when they know that they have to stand all day at work. Working long shifts while standing can create havoc with your feet. To avoid this, you need to find a comfortable, lightweight and a cool pair of shoes which prevents your feet from fatigue, sweat & smells. Not only this but they should also provide enough support & cushion at right places for people suffering from blisters, foot pains, and other painful feet related conditions. All of this can be achieved by a pair of well-fitting shoes with good foam cushioning material and a good arch support sole. 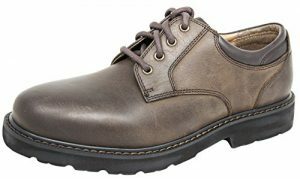 In this review, we have covered a wide selection of men’s & women’s shoes, which offer long duration comfort and support to your feet. These stylish shoes listed here were quite popular in 2018 and are continuing the same in 2019, in the work shoe category. Now let us start with the women’s shoes first. Featuring a beautifully designed strap with a floral pattern made using a laser, KEEN Women’s Kaci Full-Grain Shoe is a true definition of elegance for a modern woman. Its upper part is water resistant, keeping your feet dry even when you are in an area with water splashes. Its lining features a breathable mesh which keeps your feet well aerated while Cleansport NXT feature controls odor on the pair of shoes’ insole as well as the linings. The footbed of this pair of shoes is made of recycled foam which offers you cozy support for long hours. Its outsole is made of rubber and so it doesn’t leave marks on the surface on which you step. They are among the best shoes for crews for standing all day. Being a slip on shoe, Merrell Dassie is effortless to wear. The upper part of this pair of shoes features full-grain as well as leather materials for comfort and durability. Its straps are adjustable and have a buckle closure system for easy wear and exact fit. With a side goring, the shoes do not only fit perfectly but have a plush feel which makes them some of the best shoes for standing all day. Their heels have air cushion for absorbing shock, leaving you feeling comfortable even after standing for ten hours. The insoles are contoured and comprise of a closed cell foam known as ethyl vinyl acetate (EVA) for light underfoot comfort. When you feel that your choice of best shoes for women, for standing all day is bad, you can always go with this shoe and you’ll get incredible comfort from it. With a heel measuring about two inches and the size of its platform being roughly 0.75 inches, Dansko Professional Mule is among best shoes for standing all day long. The polyurethane outsole of this shoe is not only durable but has a rocker bottom which pushes your foot forward and absorbs any shock that may otherwise make you feel uncomfortable upon standing for a long time. Its wide heel strike and polyurethane inner frame make you feel more stable when standing for many hours. 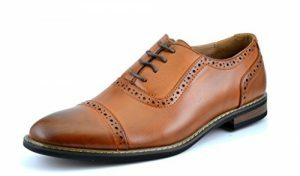 If you are looking for best shoes for standing all day in the UK, then you can’t go wrong with this pair. Clarks May Marigold was among the best shoes for standing all day 2015 and still tops this year’s list. 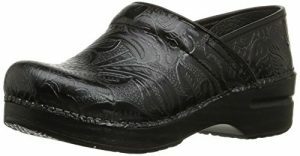 With a synthetic sole, this shoe is durable while its 1.5-inch heel and 0.5-inch platform make it very comfortable to wear for extended periods. It has a fabric lining which offers your feet a soft feel and enhanced breathability. Its footbed is made of ortholite while the outsoles feature thermoplastic rubbers for improved comfort and durability. If you are looking for a pair of shoes with all-day comfort, perfect fit as well as minimal compression, then Clarks Women’s May Marigold may be your best-set bet. They are some of the best shoes for standing all day on concrete. Earth Clover Dress has a synthetic sole for high durability and the length of its heel is about 1.25 inches. The size of the heel is ideal for those people who spend a significant amount of time standing. Featuring classic lift, small metallic decorations as well as curving leather layers, the shoes look incredibly stylish. The heel of this pair of shoes has much padding while its insole features enhanced arch support and latex cushioning with different densities for effective absorption and the displacement of shock. 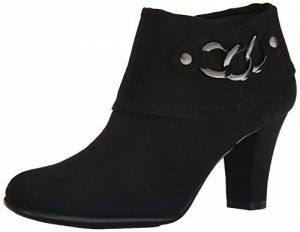 Considering all those features, Earth Women’s Clovers are some of the best shoes for standing all day overweight. Skechers have rubber soles which are not only non-marking but also prevent you from slipping and last for a long time. The linings of these shoes are perforated for improved breathability which prevents the accumulation of bad odor and leaves your feet feeling aerated. The upper part of this shoe is made of soft leather for durability and a beautifully designed panel that is fully laced up for a cool look as well as comfortable fit. Its heel is approximately 1.5 inches long, a height that’s ideal for long hours of standing. 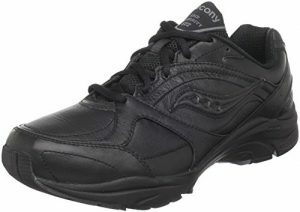 These shoes from Skechers are some of the best shoes for standing all day in Australia. With a heel size of 1.5 inches and a removable ortholite insole, this pair of shoes offers you the much-needed comfort and stability for standing all day without feeling muscle strains on your legs. Its lining is soft, offering a soft feel to your foot and the shoe features stretch fabric panels to enable you to walk comfortably. The shoes upper is also well perforated for proper air circulation to keep your foot well aerated and prevent the accumulation of bad odor. 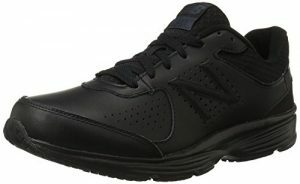 They are among best shoes for standing all day with plantar fasciitis. 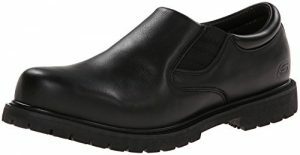 If you are interested in the best shoes for standing all day in Canada, then Franco Sarto Bocca Loafer for women has your back. This shoe has a rubber sole that lasts for a very long time besides offering good traction. Its heel is roughly 1.25 inches high and its platform is 0.5 inches wide, the shoe measurements which are suitable for standing for a long time. The shoe isn’t only comfortable to have on for a long period but provides the elegance that a modern working woman needs. Its upper features a partially polished leather material and tonal stitches which give it a fantastic look. 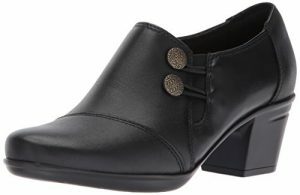 They are among the best shoes for women for standing all day at work. With a heel height of around two inches, Danskos are neither too high nor too low but has an ideal height among the best shoes for women, for standing all day. The width of the platform of this shoe is roughly 0.75 inches for enhanced stability while its midsole is contoured for arch support. The shoe’s toe box is spacious, keeping your feet comfortable even for an extended period. Its locker bottom sole is made of polyurethane for the protection of your legs, feet as well as the back from the strain that can result from standing for a long time. They are among best shoes for women, especially for teaching, among other professions that require a lot of standing time. 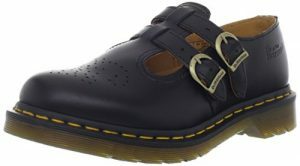 Dr. Martens Women’s 8065 is one of the best shoes for standing all day especially for those with foot muscle stress. The size of its shaft from the arch is roughly 2.5 inches while the height of its heel is around 1.5 inches. With a platform width of nearly 0.5 inches and a trendy finish featuring buckle straps, the shoe offers much-needed stability for long hours of standing and is classy to meet the fashion needs of a modern woman. 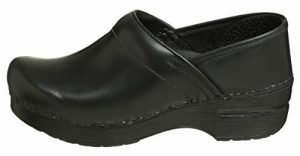 It is one of the best options in comfortable shoes for women, for standing longer periods in their recpective profession. With this last product review, we’ll wrap up here if you’re looking for the best shoes for standing all day. Any of the above-listed shoes is a worthy buy. 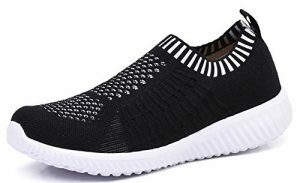 Having researched many positive reviews concerning these shoes from customers, we can confidently say that they are among best shoes for standing all day even with swollen feet or if you are looking for best shoes for women for standing all day in flats. Dress shoes are known for looking a little too commonplace and die-hard connoisseurs can tell you, the Cap-Toe Oxfords by Dockers are no exception. If you know what dress shoes look like, you don’t need to look up any pictures of these, they’re almost exactly what comes to mind. 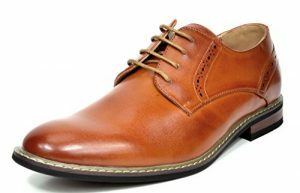 Available in a wide selection of colors ranging from ‘Businessman Black’ to ‘Seventies Pop Star Silver’, not leaving out the oh-so-stereotypical tan brown, of course, these Dockers get the dress shoe look about as right as you could. Even the one-inch heel, which looks like it could be used effectively to stomp even the largest bugs to death, seems both imposing and elegant enough to grace any dance floor, no matter how expensive. Speaking of which, the Dockers are honestly not really expensive, starting at just under $50. 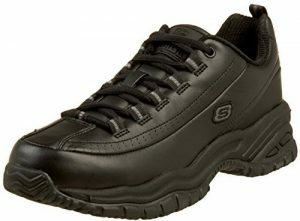 Now, the untrained eye may mistake these, the Cottonwood Goddards by Skechers, for dress shoes. Be warned, though, as they are not. First of all, they’re slip-on, which, in this day and age, is an almost immediate and ultimate dis-qualifier. Secondly, their slip-resistant, thick rubber soles are clearly optimized for the workplace and we don’t mean the office and would arguably look out of place anywhere else. 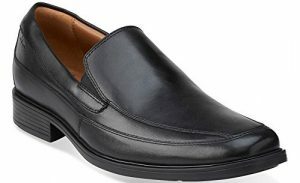 Still, one has to say that the Goddard doesn’t look half bad for a worker’s pair of a slip-on. They’re rugged, sure, but they also have proper leather, nice contours and a padded collar that somehow manages to look pretty inviting. And you can certainly bet on them being comfortable and tough enough to last a lifetime. For $40 and up, what have you really got to lose? Yet again a completely different style, the Cotrell Edge Oxfords by Clarks try to fuse the elegance and simplicity of traditional dress shoes with styling motifs from today’s running and walking shoes. What you get is a stunning mix of leather, fabric, metal, rubber, and cotton. Specifically, metal eyelets, leather stitching all around, rubber soles, flexible fabric for the tongue and a fluffy, cotton-padded collar. Okay, well, it’s not actually genuine cotton, at least we’re pretty sure it’s not, but that’s beside the point. With an aggressive stance, but enough professionalism so as to not look ridiculous when worn by an adult, the Cotrells are an interesting proposal. A competitive price and five color schemes “even though almost all of them are brown” makes them even more interesting. Slip-on, once more, but this time, they’re more elegant, more fashionable, more professional and more uptight! Made by little-known brand Bostonian, the Bolton’s are a very simplistic-looking piece of footwear, but that doesn’t make them any less interesting than the competition. Leather as high-grade as this, is a rarity in the low-price market the Bostonians are positioning themselves in, as is a flexible, cushioned removable insole with arch support. 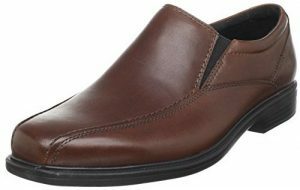 The square toe gives these slip-on, a kind of a working man’s look, but perhaps that was intended to be so. The overly grippy, thick rubber outsole certainly points in that direction, which means the Boltons are most likely to impress those who want to marry tough dependability befitting their work with a healthy dose of style. If that sounds like your thing, Bostonian has got you covered. Or rather, your feet. Style! High-grade materials! Leather that comes with weather marks straight from the factory! Okay, so perhaps the Northfields’ exact design language won’t appeal to all, but something that has to be said about them is their sheer visual versatility. Here is a pair of great shoes that will surround your feet with comfortable, pleasing sensations anywhere you go, and nowhere will you get strange looks for wearing them. Fancy restaurant or construction site, it doesn’t matter, the Northfields will feel right at home. So perhaps it would be better to pick the glossy black finish for the former and a weathered tan brown for the latter, but what are those six color options for, if not that? 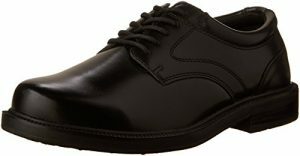 With a thick, and we do mean thick outsole that absorbs nearly any impact, a truly well-made midsole for once, full water-proofing, ventilated surfaces and an interior that is almost too luxurious and accommodating for this low price, the Northfield Oxfords by Rockport are just about right for anyone. Those looking for individualism will probably be better off with something more specific, though. The name says it all: This is for work. What kind of work, you ask? Well, listen to the name again. Cottonwood. Elks. What do you associate these two things with? Lumberjacks? Snowy forests? Both at the same time? You’re on the right track, these shoes were designed for those who operate in tricky environments, that much is evident. With a fully slip-resistant sole almost as high as the rest of the shoe, it seems and dependable materials, the leather shows just about enough stitching so as not to fall apart immediately, which makes cleaning easier, not to mention those fancy metal eyelets, the Cottonwood Elks are tough, period. Still, they don’t forget about comfort amid all of this, with great padding and a fit that doesn’t force your feet into awkward postures in the name of safety or function. Add to that a low price, and you’ve got a perfect deal for those hard-working, elk-hunting lumberjacks. Or, well, anyone who can appreciate the above. See that name? ‘Tilden-free’, it says. You surely scratched your head at reading it at first, maybe even tried googling it, but to no avail. What is it, you may ask? Nothing. Absolutely nothing. The Tilden Free Slip-on Loafers are not ’tilden-free’ because there’s no such thing as ’tilden’ to be free of in the first place! Clarks made it up. What for? Who knows. The thing is, all that Tilden Free means in this particular context is that you’re getting a very, very ‘fancy-schmancy’ pair of loafers at an affordable cost. With a slim, crammed toe tip that points upwards as those of nice dress shoes tend to do and a thick heel that doesn’t shy away from showcasing the strong, robust sole on its underside, you could easily show up with the Tilden Frees on any dance floor in the world and no-one could complain. Unless there was something wrong with the rest of your outfit, that is. True, ‘Shelter’ might not have been the best of names, but the shoe itself has a lot going for it, such as the unique look, including weathered-down leather, an overly thick, prominent heel and sole, round metal eyelets and body-colored, synthetic laces. Impressive, right? Not really. True, most of the styling cues that the Shelters employ have been done to death before on many other Dockers products but that doesn’t make them bad footwear, now, does it? Of course not, especially as they do have their unique, redeeming qualities, first and foremost of which is the exquisite wear comfort. Thanks to a nice arrangement of finely-tuned soles, thick padding and a great shape overall, your feet will be delighted to sit in these and, leaving out all those pesky styling debates and dumb discussions about pricing, that’s what really counts in the end, right? With such language as ‘Leader 2 Bike’, the number being a stand-in for the word ‘to’, in case you haven’t got it, one might assume the Leader 2 Bike to be a very juvenile, pubescent, hormone-laden kind of shoe. You know, brash, flashy and overly childish? That is surprisingly not the case at all. Instead, what you have here is a very professional, honestly made loafer “professional as in, all surfaces are treated with anti-microbial lining to prevent the wearer’s holy feet from contracting any disease” and it isn’t even that cheap. Prices start at roughly $80, so the people buying these are certainly not fifteen-year-old bikers. To be honest, the reason for the peculiar name may have been the bicycle-toe design all along, and it’s easy to guess there’s not much more to it than that, especially given the target audience. Deer Stags may not hold any real value as a brand name, but their shoes make a statement, and not every shoe can say that about itself. With an ultra-glossy leather finish straight out of the box (in fact, we think they may have overdone that part) and thick padding on the inside to ensure a great wearing experience, coupled with a synthetic, anti-slip sole, (though the ‘anti-slip’ part is to be taken quite lightly) the Times Plain-Toe Oxfords look like an interesting proposition. Then you take a gander at the $20 price and realize that all of those fancy-looking features are made out of rather not-so-fancy materials. Still, for bargain hunters and those looking to piece together a certain style of the wardrobe with little effort, and those who don’t need their shoes to last them a lifetime, these Oxford-style dress shoes by Deer Stags may be just about right. 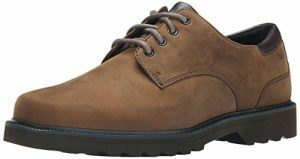 Comfortable shoes are must for every work environment, whether you are in a corporate office, field job, behind the desk, a retail outlet or any other workplace. People who have sitting jobs are less worried about the features like structure, comfort & support of their shoes. These features are totally different for a person who is doing a standing job or walking on hard surfaces for longer or double shifts. For them, it is important to find a pair of shoes which is more shock absorbing, with better cushioning and support. You can consider some other features while researching these shoes like lightweight nature, quality materials, breathe-ability of shoes, slip-resistance on the sole and an important factor obviously is the “Look”. 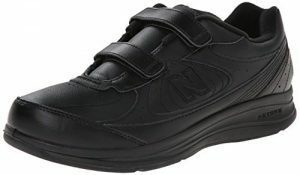 Along with comfort, these shoes need to be attractive and appealing. The following part of our review features comfortable shoes for men and women walking on hard surfaces all day. Some of these are slip-on and some are lace-up shoes. You can choose the type and color you like. These quality skechers are specially made for women yearning to walk comfortably on rough or soft ground over long distances. Sketchers performance women shoes are so light; it feels like you are wearing socks. They have a good grip with no chances of slippage while walking on any terrain. Similarly, the shoe flexes perfectly, making natural foot movement possible. They give the lower back and hips enough support and there are no chances of ache or discomfort. They are the best walking shoes for women with arch support all thanks to a tampering mid-foot design. New Goga Max footbed empowers every step. 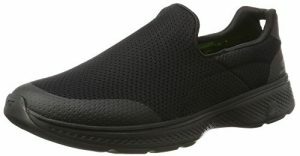 Skechers performance women’s go walk 4 pursuit shoe features, 1.25 inches heel, mesh fabric, rubber sole, seamless construction, soft mesh upper and 5GEN midsole cushioning. The footbed is bamboo lined to control antibacterial smell. 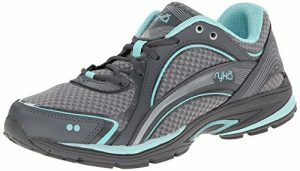 These are among the best supportive walking shoes for women; in water or on dry ground. They are made of 90% fabric rubber sole and an air mesh cover for maximum air circulation. Solyte midsole technology prevents midsole breakdown and improves bounce back. Water grip sole, on the other hand, makes walking on wet and slippery grounds possible these shoes are easy to clean; you can remove the inner sole and drain water and all the dirt will flow out. When the shoes are wet, you will still feel okay in them; the comforDry sock liner does the magic. They dry up faster with the help of the hole below and the open mesh on the upper side. The upper fabric of these shoes allows enough air circulation thus your feet can breathe. Their outer sole is highly elastic, resistant to slip and can manage any terrain without damage. Individuals with wide feet are well-taken care; they can have the 0.5 size up. They feature a beautiful design and are very light; what every woman needs. These shoes are a perfect choice for casual wear as they are fashionable and beautiful. They clean easily and dry fast. They feature an elastic top line so you can wear and remove them effortlessly. The Solyte midsole offers exceptional bounce-back characteristics and durability. The ComforDry sock liner offers a healthier, drier and cooler shoe environment. Ranks top among the best walking shoes for women in 2019. These shoes are made of high quality, durable leather, and a rubber sole. New Balance gives athletes the best comfort and balance that enables them to succeed. This special sneaker is not only made for walking but also for running or any other physical activity. Your feet can breathe through the leather outer cover. You can fit these on perfectly after adjusting the hook and loop straps. You can only feel how good they are after you start walking; they are light, classy and beautiful. Cushioning of the heel and inner sole makes them cozier when walking on any ground. Improve your strides with vionic women’s walker classic shoes. They feature removable orthotic with bacteria control treatment and podiatrist design. These shoes are made of durable, water-resistant leather. Maximum support is given by the Orthaheel motion-controlling footbed plus a heel cup that realigns your steps. EVA midsole absorbs shock; you can walk or run comfortably on a hard surface without fear of injury. They are among the best walking shoes for women over 50. 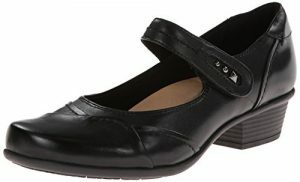 Vionic women’s walker classic shoes have sock liner and a polyester upper lining. They look classy and serve over an extended period. 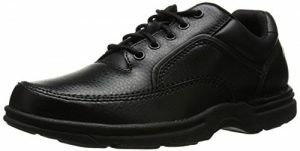 It is time to look classy in Sketchers performance women’s walking shoes. They are made of fabric and synthetic; the fabric top stretches easily. Similarly, these shoes have a large forefoot and pull on the heel to fit perfectly and zero struggle on/off. The bad odor is eliminated by the antibacterial sock liner while ortholite footbed guarantees comfort. These shoes offer Cushioning support and have a resalyte midsole that absorbs shock perfectly. The outsole is flexible and has GO impulse sensors for sensory feedback. They are the best walking shoes for women with bunions. 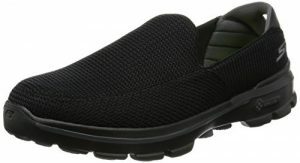 Enhance your walk with RYKA women’s sky-walking shoe. Besides their beautiful look, they provide unlimited comfort when walking over any terrain. They are covered by a mesh supported by overlays that allow your feet to access fresh air. Sleek midsole makes these shoe light thus you can walk for miles in them without the need for rest. These amazing shoes offer services over an extended period all thanks to the rubber sole. Sockliner prevents terrible odor and absorbs additional moisture that would tamper with your feet. Are you searching for the best walking shoes for women with arch support? 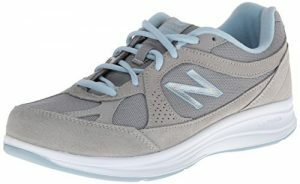 Then new balance women’s WW877 walking shoe is what you need. It gives maximum comfort required by every athlete who intends to achieve a goal. A mesh cover allows free air circulation inside the shoes. They are made of rubber sole that is strong enough to endure every terrain without damage. The mid-sole absorbs moisture and helps to eliminate any bad smell. This shoe weighs very little and is a blend of style, beauty, and convenience. Nothing gives you the morale to be more active than good looking shoes. 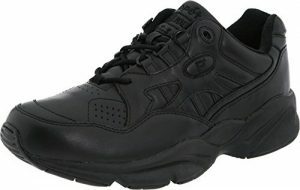 When in the Jim, walking or in the field, you need to be in a pair of sketchers performance women shoes. These elegant shoes have a mesh upper and synthetic body purposely for ultimate air circulation. The shoes have a fabric footbed and fabric lining that enhances comfort. Resalyte midsole and outsole, on the other hand, offer support, durability, and traction. These uncomplicated shoes feature resalyte cushioning, rubber sole and ortholite footbed. They are free from bad odor. Saucony women’s shoes are made of high-quality leather that provides durability. With the rubber sole, you can effortlessly walk over rough or soft ground. 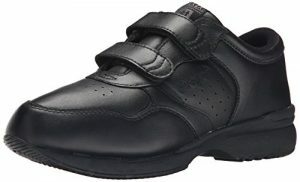 These shoes feature padded collar and tongue plus XT-900 material. Cushioning enhances relaxation while the outer sole keeps the shoe firm and comfy. Walking in the Saucony women’s pro grid integrity ST2 walking shoe is handsomely rewarding. You can adjust the top laces for a perfect fit. They possess the best qualities and hence are the best walking shoes for women, for travel. Every woman wants to look good whether in casual wear or when engaging in physical exercise. Women’s walking shoes should be comfortable, convenient, durable and good-looking; anything less than the four qualities should not be considered. The information above regarding the best walking shoes for women is thoroughly researched, clear, true and concise. Choose one or more of the shoes listed above at affordable prices. What’s more? All the shoes are durable, innovatively designed and are of high-quality. Order yours today and thank us later. From Skechers come the pretentiously-titled Incredible Walking Shoes, but do they really deserve that boastful name? The short answer: Yes! These Skechers Performance shoes are set out to impress, with style and comfort being their key selling points. They certainly are a very fashionable pair of walking shoes, with countless paint schemes to choose from, including mono, bi and tricolor variants. With their thick soles, integrated one-piece tongues, pull holes instead of the often finicky flexible tabs and tapered pronounced arches, they look sporty and function does follow form in a certain way here. Thanks to a ‘breathing’ design, meaning large portions of the shoe are ventilated, the Go Walk 4s are insanely comfortable to wear, especially after long hours of workouts, since the aforementioned ventilation effectively gets rid of any annoying sweat buildup. A Velcro walking shoe that’s not for kids? Sacrilege! Burn it! We imagine some, if not the majority of prospective shoe shoppers to react this way upon first seeing a picture of the Hook and Loops, and it is understandable why you would immediately deny this unusual pair any chance of getting a spot in your collection but for those who can deal with the thought of owning velcroed walking shoes, read on below. So, how are the Hook and Loops by New Balance? Pretty good. 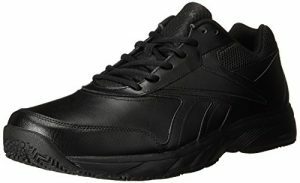 They’re well-ventilated, not as extreme as, say, the Incredible Walking Shoes by Skechers, but still very effective. They also possess a very snug fit, with padding on the collar and tongue ensuring that it all stays comfortable, too. And they’re made out of real leather, a rare sight on pairs under $30. The Work and Cushion 2.0s by Reebok excel by not excelling at anything in particular. They’re the supreme example of how conformity and not trying to reinvent the wheel can go a long way towards making a great product that’s focused on quality, not excessive style or innovation. The Work and Cushion 2.0 is a very basic shoe, available in either black or white leather, with a perforated collar and elastic tongue. That’s it. It works great, the materials are well-chosen, for a $30 pair, the craftsmanship is excellent and, thanks to the low-key, understated design, nobody is going to give you funny looks when you’re wearing them. 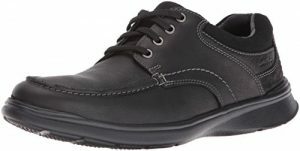 For those whose wardrobe follows a mostly anachronistic, classic style, the Eureka walking shoe by Rockport is ideal. With real leather in either chocolate tan, tuxedo black, brown or two-tone nubuck variants, these shoes look amazing and can go in with any outfit. There’s a lace-up vamp, padded collar, and tongue that feel more comfortable than the competition by a long shot and, to top it all off, round metal eyelets that only complement the retro look. Their price is higher than most on our little roundup (they start at $50) but if comfort and style are your things and you don’t want to compromise on them when going for a jog, then these are the shoes for you. Another New Balance product, the MW441v2 features a much sportier, more common and hip design than its velcro-equipped counterpart above. 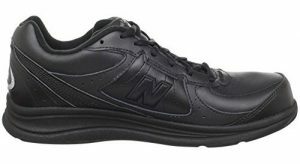 With ‘N’ branding on the side, an adjustable padded tongue, and short collar, it looks like a walking shoe is supposed to. Available in a handful of both monochromatic and two-tone color schemes, it is also pretty flexible in the style department and should fit into nearly anyone’s collection easily. 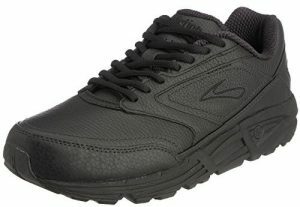 Ventilation exists, but only on a small area on the side (not optimal, as the brilliant Go Walk 4s by Skechers have shown). 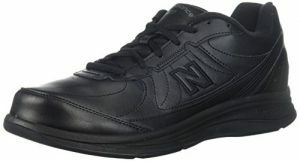 Still, for those who don’t have such an intense regimen and still want to look good, the MW411v2s are a good choice. The Go Walk 4s were already a very minimalistically-designed pair of walking shoes, to begin with, but the Go Walk 3s represent the cheaper, even more, basic companion model. No laces, a fixed tongue without any padding and the 4s’ signature pull holes all make for a unique-looking piece of apparel. The sole is worthy of special attention here: It’s full of studs, like that of a football shoe! This gives you great traction when jogging or walking on almost any tricky surface. 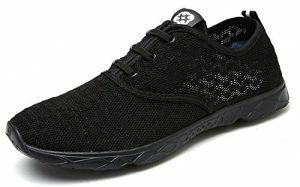 To take care of the sweating problem most runners inevitably face, the Go Walk 3s, like their more elaborate sister model, features a ventilation system that spans pretty much the entirety of the shoe excluding the outsole, but unlike the Go Walk 4s, this one sports a mesh-type pattern for a unique look. For a hefty premium of $100 and up, you can get yourself a pair of Brooks Addiction Walkers, and the name was clearly chosen well. Thanks to an interesting build with a high, thickly padded collar and enough interior padding to serve as a cozy bed for almost any small rodent, these Brooks walking shoes are seriously comfy to wear even for very long. They don’t look that bad either, thanks to natural leather and an attractive, modern shape. There’s exquisite arch support, too, but one thing threw us off: no ventilation of any kind, which is a big shame. Still, if you can live without it, the Addiction Walkers are probably the most satisfying pieces of leather and fabric to put your feet in, at this price point. The Velcro epidemic lives on! Affordable luxury brand Propét is the second on our list to dubiously, almost inexplicably offer adult’s walking shoes with hooks and loops instead of the tried-and-true laces we’ve gotten used to, ever since hitting puberty. The Walker Strap Sneakers feature partial ventilation in three separate, small zones, which is better than no ventilation at all and this combats annoying perspiration to a significant degree. They also feature a relatively low-sitting collar and an adjustable, padded tongue. The rubber sole is nothing out of the ordinary, but is well-textured and provides good grip. 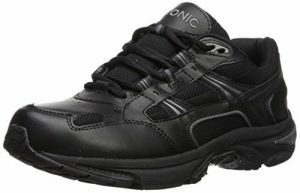 So, once more: If you can put up with the lack of laces, then this is a fine pair of walking shoes for just under $20 at their cheapest. Propét also offers a lace-up pair of sneakers, which will probably be an easier pill to swallow for most of us. Available in nearly countless trims and colors, no box is left unchecked in the looks department. There’s enough ventilation to make it practical to jog with the Propét s for hours on end, and the high collar, as well as the tapered outsole, provide great support. Starting at a mere $15, you shouldn’t expect award-winning craftsmanship, but for what they are, the Stability Walkers are a nice pair to have. Similar to the rest of their lineup, New Balance’s MW577 looks decidedly average from the outside but packs practical ventilation, thick padding and a supportive shape for a blend of function and style. Mostly function. Available in white or black, and starting at $35, it faces some tough competition from other brands, but we found the MW577s were well able to hold their own during testing partly thanks to their grippy soles, the comfortable, plush interior and the thick, padded collar which provided support with only a few equals. Materials used are mostly leather, thin fabric, and rubber, but they’re the good kind, better than what you would commonly expect from something in this price point. Choosing a pair of walking shoes is largely a matter of preference. Yes, we may have spent quite a lot of time in this article debating over each pair’s respective real-world performance but performance can only get you so far. Your choice should reflect your personal taste. It should also blend in with the rest of your wardrobe and it should most definitely be as usable and practical as you need it to be. Keep this in mind, and we’re sure you’ll find the perfect pair of walking shoes in no time! 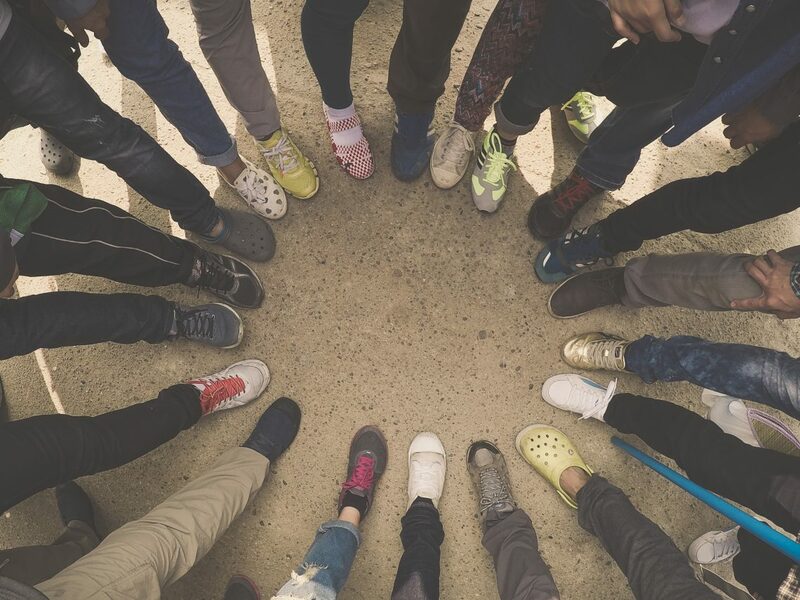 We know what you are thinking,”Dress shoes and comfort – aren’t these two different things?” Yes, they are different, but now many brands have succeeded in implementing these two factors simultaneously in a pair of shoe for women and men. The shoes listed here cover all these four aspects. So now let’s start again with the women first and dig out some nice dress shoes. Literally, any shoe can be worn to match up your dress. However, you might need to add style and elegance to create a sense of fashion by matching up your shoe to the outfit to project a more organized official or casual look. Despite the fact that a dress shoe needs to be stylish, comfort is a key ingredient which every one looks for. With the many brands, suppliers and manufacturers in the market, it may prove to be a hard task in selecting what is best for your feet. 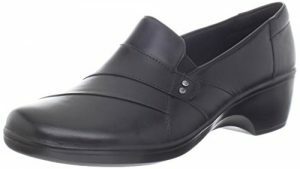 Listed below are dress shoe reviews for the world’s most comfortable women’s dress shoes ever. With a leather upper and polyurethane outsole design, this shoe will undoubtedly serve you for a long time. It is so much comfortable, thanks to the cushioned outsole, roomy toe box, which provides 100% protection to the foot, and the rocker bottom, all of which are meant to prevent shock resulting from foot impact. The shoe is therefore listed among the most comfortable women’s dress shoe for bunions, arthritis, plantar fasciitis or any other leg related pains. Experiencing ordinary scuff marks on the leather? Don’t worry, since it will simply be sorted out with a touch of shoe polish. The height of the heel measures is approximately 2″ with a wide heel strike, so that you may get enough stability when walking or standing for more extended periods. If you want to add a more classy look, you can select your preferred color from over 20 available color varieties, to easily match with your official or casual dress. 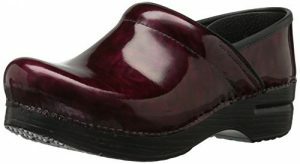 For many years, Clarks has remained as the most comfortable women’s dress shoe brands. Therefore, adding the Women’s May Marigold Loafer to your wardrobe is never a risk. It is made of synthetic material and extra soft leather upper. It, therefore, stands to be the most comfortable women’s shoe for work, as you go about your official duties. The shoe will give you enough comfort and breathability to your foot, thanks to the ortholite footbed, fabric lining, and well cushioned inner sole. Putting it on is quite a breeze since you just slip-on as you get going. With a heel height of just 1.25 inches and 1/2″ platform, Clarks Women’s May Marigold will enable you to stand for a long time without stressing your feet muscles. 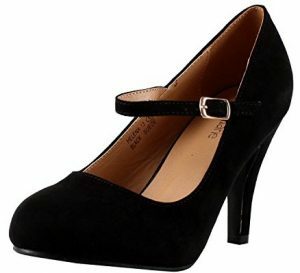 Due to this, the shoe has been rated as the most comfortable women’s dress shoe for standing. Predictions Comfort Karmen pumps are made of polyurethane, soft jersey lining and a memory foam insole with a rounded toe. Standing at 3-inch heel height, these shoes prove to be the most comfortable women’s dress pumps for both official and casual wear. Whether you are dressing up for some business meeting, an outing, official duties or some casual functions, you can match it up with your outfit for more elegance and organized look. With the cushioned memory foam insole and the flexible outsole, you are very much assured of a comfortable and stable walk all day long. Soft Style Women’s Angel II pump will leave you with enough comfort for your feet. The insole is padded with a metallic mist sock cushioned lining and additional latex foam footbed; all of which offer maximum comfort and breathability throughout the day. The shoe has been designed from high quality synthetic, patent leather upper and polyurethane outsole. Soft Style Angel II is a low-heeled pump measuring approximately 1.25 inches. It is best for people who can’t wear high heels, and they’re constantly on their feet all day long. 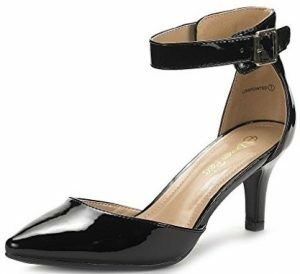 With a pointed toe, exposed sides and buckled ankle strap, Dream Pairs women’s pump shoe has been reviewed as the most comfortable women’s dress shoes 2017, and it still holds that title. 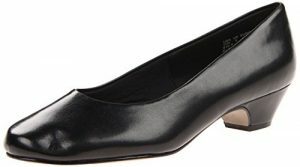 This dress shoe is a low-heeled stiletto, designed for smooth vegan leather and textile. You’ll never miss your color preference because there are trendy varieties for matching with your dress as you go to a wedding, an event or formal meeting. The heel height is 3 inches while the platform measures 1/2 inches. Even though you might not prefer wearing heels all day long, the Dream Pairs dress pump shoes will guarantee you maximum comfort achieved by the thermoplastic rubber sole and latex padded insole. This classy chick ankle bootie is exactly what you need on a cool fall day. The Aerosoles First Role ankle boot is made of synthetic with a soft faux-suede finish, diamond flex soles, and a zip closure. For more elegance, it has a wide cuff, and side chain-link embellishment maintained in place by two studs. The cushioned memory foam footbed ensures maximum comfort, breathability and generating enough heat especially during winter. The 3” heel that has been incorporated with Heel Rest Technology for directing the body weight into the heels offers maximum stability and balance. 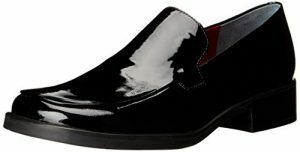 Clarks Emslie Warren loafer is designed with leather upper, metal embellishments on the sides, soft fabric lining and a thermoplastic rubber outsole. 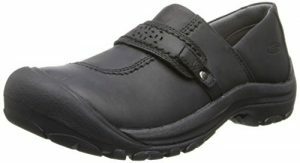 With a heel height of 2″, it stands to be the most comfortable women’s dress shoe for work, casual wear, interview or when having any other outdoor activity. 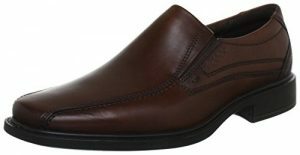 Clarks Emslie Warren loafer is a slip on and would fit snugly with elastic goring. The cushioned foam layers in the insole, ortholite footbed, and the soft fabric lining offer comfort. Being a 3-inch stiletto and made with sparkling glitter design, Bella Marie Mary Jane pumps are perfect dress shoes. They are made of synthetic, suede material with a rounded toe and buckled strap. The shoes are available in a variety of trendy colors, which will easily match up with your dress; whether dressing for a wedding, picnic, a day out or official duties. If you’ve got narrow feet or heels, Bella Marie stilettos are a good option since the buckled straps will keep your feet in place. 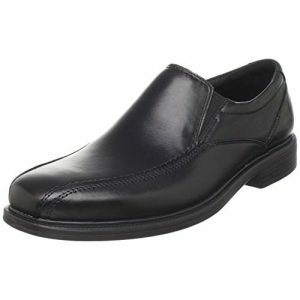 Eastland Classic II penny loafer is made of synthetic, polished leather upper and thermoplastic outsole. Its cushioned memory foam footbed ensures more comfort and shock absorption capabilities upon impact. 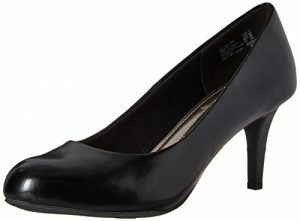 With a 7/8 inch heel height, Eastland Classic II has been rated as the most comfortable women’s flat dress shoes. It is available in 4 different colors; black, brown, tan and navy, which are just perfect for attending any formal job interview. 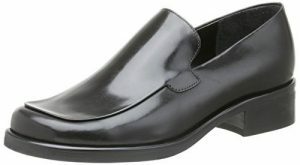 As one of the most comfortable women’s dress shoes for standing, Franco Sarto Bocca loafer is the ultimate choice if you majorly walk or stand for more extended periods. The shoe has been designed with a semi-polished leather upper and rubber sole. Moreover, it has a downturned apron-toe seam and tonal stitching. The heel is lifted with height is 1.25 inches and platform measurement of 0.5 inches. Comfort is achieved by the smooth inner lining and cushioned insole which also prevents shock resulting from foot impact. With the above list of the most comfortable women’s dress shoes, you’ll have up to 10 options to choose from. Some of the considerations you’ve to put in place before making a purchase include; the foot arch, size, cushioning, design and of course the comfort. As you wear your dress to the office, on a wedding, job interview, picnic or a day out, you can perfectly match it with a stiletto, flat shoe, pump, boots or loafers and still maintain a classy look. True, wingtips might not exude professionalism or class in the same way a more traditional pair of dress shoes probably could, but when coupled with the right outfit, they can give the wearer undeniable presence. Whatever the case, whether in a two-tone color scheme or monocolored, whether with ornate perforations akin to a work of art or just simple, clever use of thin leather stitching, whether in professional black or exuberant light brown, a wingtip is a style of dress shoe you just have to try at some point. And DREAM PAIRS’ offerings are not only very high-quality examples of this style; they also simply make a huge lot of them, meaning you can just about try every variation of the wingtip theme there is to see which suits you best. For some reason, Clarks like to use the term ‘Tilden’ on quite a few of their products. From ‘Tilden-free’ shoes to ‘Tilden caps’ like this pair, there is quite a lot to choose from. Thing is, though, tilden is not a proper word, and it doesn’t mean anything. They made it up. Well, at least they remained no-nonsense with the ‘Oxford’ part. Black, shiny leather, quarter brogue, large, imposing heel and an almost arrow-shaped, slim toe tip; it’s all there. The Ortholite insole is not just a sweat and body odor magnet as advertised, it’s also really comfortable, more so than the vast majority at this price. If you want to go for a professional look, this might just be your best bet. Combining the traditional perforations of wingtips with more conservative design elements from Oxfords and some other dress shoe types, the Princes by Bruno Marc could be the very best way to make that ‘casual, but suave’ look work without unnecessarily high amounts of effort or a wardrobe that’s too flashy for its own good. The Princes are not minimalist, but then again, they don’t scream ‘Look at me!’ in the way almost all wingtips do. Because they favor an understated, semi-professional look, the pair is mostly offered in darker colors, but all variants include the same, ultra-comfy insole, wooden heel and beautifully decorated outsole. A little exotic, that’s for sure, but a great pair if you already happen to know what for. 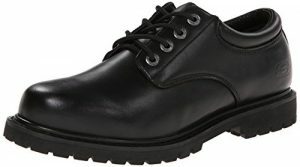 For a more rugged, all-weather look befitting a true adventurer, these Cap-Toe Oxfords fuse thick heels, even thicker outsoles and yet again thicker padding for maximum cushioning and safety with design elements you’d commonly expect from dress shoes, such as the quarter brogue-style leather lining. Unlike most others, the Dockers don’t shy away from showing their best assets; whether that’s the unusually thick and prominent laces, their shiny, round metal eyelets or the aforementioned large outsole protruding from the main body, fusing with the even larger heel at the rear. All of this makes them a unique proposal, one that still manages to look fairly dressy and professional amidst all those funky design ingenuities. This is one experimental pair that you can rightly wear to a conference meeting or courtroom and not get funny looks thrown at you for. Although simply advertised as an Oxford, most, apart from diehard shoe connoisseurs who know their definitions in and out, would arguably look at the Dickinson and call it a wingtip, no argument. From the lines of perforations snaking around the toe, collar, heel and tongue, to the consistently narrowing silhouette when viewed from above, to the classy, fully wooden outsole, it just seems so obvious to call these dress shoes wingtips proper, right? Well, fortunately, Stacy Adams knew what they were doing and didn’t commit a marketing mistake. You see, technically speaking, only shoes with a full brogue lining pattern can be designated as wingtips. Since the Dickinsons are quarter brogues, they don’t count, simple as that. Definitions aside, they’re a stunning pair that’s perfect for those who want to draw some looks without going for something obnoxiously flashy or extrovert. Loafers are hard to do right, some would say. Too often, they look like leather slippers that had too much to eat, and slapping high-end materials or brand names on a design that’s already laughable is never going to solve that problem. Fortunately, Dockers saw through this and created the Proposals. The pitch? ‘A shoe for professionals, for businessmen, for artists and actors and the like. Just without those annoying laces.’ And, did they get it right? Thankfully, yes. Very much so. The Proposals are as formal as any other dress shoe you could possibly think of, with discrete, understated lines and a great aura of sincerity and style. They don’t overdo anything in particular; even the leather stitching and the one-and-a-quarter-inch heel are neatly and fluidly integrated into the overall design so that they don’t poke out or cause unwanted attention. And, to top it all off, Dockers didn’t forget about comfort, either, something too many dress shoe makers unfortunately often do. Another, equally formal and straight-to-the-point pair of slip-ons are the Boltons by Bostonian. With a fully square toe and near-miniature heel, they get that ‘Businessman’s shoe’ look just about right. On the inside, feet are treated to the luxuries of Bostonian’s exclusive Flexlite insole, which is not only cushioned to the max, but also features great arch support, a sad reminder that ergonomics tend to be ignored in favor of style by contemporary dress shoe makers. 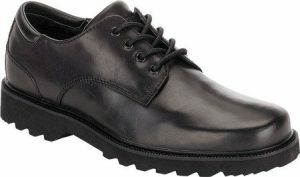 The padded collar and elasticized goring connecting the tongue and quarter, equally unheard of on most dress shoes, further exemplify this. Still, the Boltons manage to look as formal and serious as they come, making them a highly attractive proposition. Keen eyes will very quickly detect the overall similarities between the Ipswich and the Boltons. In fact, the main body, including interior surfaces, is nearly identical. However, as is equally obvious, the Ipswiches are a lace-up design, and they do feature a completely new EVA outsole and midsole. They also retain all the comfort of their slip-on relatives, from the excessive padding to the unique Flexlite insoles, while adding some new stuff of their own. Now, not just the insoles, but the entire footbed can be removed, and the shoes themselves are more heavily ventilated. All in all, if you were impressed by the Boltons, but were looking for something more traditional and don’t mind marginal upgrades and improvements along the way, then this is the pair for you. At up to $190 depending on size and color, the New Jerseys by Ecco are definitely playing with the big boys, not relating too much to the rather budget-focused, sub-$100 alternatives above. But just how much can that money buy you? Lots, it turns out. Besides a reputation for excellent reliability, you get much higher-grade leather surfaces, more detailed, classy stitching and a synthetic, robust textured outsole with an actual shock point “why do those cheaper pairs not have that, anyway? Additionally, there’s a bicycle toe design for those who are fond of such things and elastic goring between the quarter and tongue, too. It doesn’t really get dressier than this, but expect to pay for it. 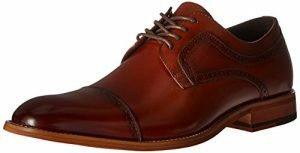 The Northfields by Rockport are probably the most radical departure from traditional dress shoe design “while still technically remaining dress shoes “one could think of. Just looking at everything midsole and up, that doesn’t seem to obvious. What you have here is a perfectly normal, even slightly featureless dress shoe design, the shiny metal eyelets being its only real saving grace. Then you look down, and the huge outsole falls into your field of view, and now you’ll never be able to unsee it. There’s no getting around it: It’s huge. Not only is it huge, as if that weren’t enough, it’s also very intricately textured for anti-slippage proofing. What you end up with is something that looks like a strange hybrid between a dress shoe, a sneaker and a boot. Hey, at least it’s fully waterproof, anti-slip, ventilated and air-circulated! It even has a stability shank. You know, those that mountain climbers use? It’s a very practical, very interesting, certainly very unique pair, but please, don’t couple it with an all-black outfit and a three-button suit. Know how informal it is in terms of appearance and use it accordingly. As should be fairly obvious, none of these pairs or any others for that matter may suit you perfectly and that’s down to both, your taste in style and your existing wardrobe. No single piece of clothing or accessory, that includes shoes, should ‘make the look’, they should all individually complement it. Thankfully, most manufacturers nowadays have some sort of try-on-for-free program, which enables you to test whether any of these pairs match with what you’ve already got. Looking at these shoes I saw ugly but comfortable shoes. And we, ladies, want to look great! So that’s why follow the link and choose beautiful and convenient boots .